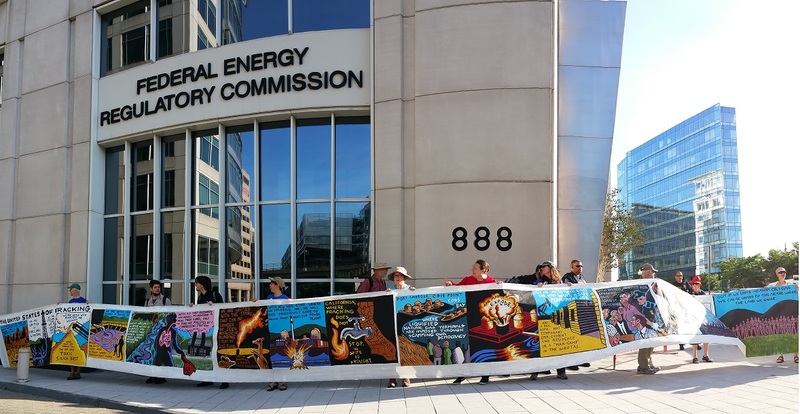 Over 50 people arrived at the Federal Energy Regulatory Commission headquarters this morning for the third day of protests this week, organized by Beyond Extreme Energy. 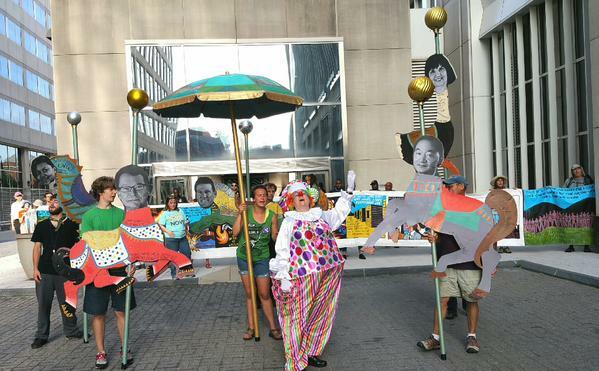 Today, protesters used circus-themed artwork to help make the point that FERC’s rubberstamping process is a joke. The artwork included a hand-crafted carousel with pictures of the faces of the five FERC commissioners; Norman Bay, Cheryl LaFleur, Phillip Moeller, Tony Clark and Colette Honorable. This idea is encompassed in one of the hashtags of the week: #FERCus. FERC approves nearly every permit that comes before it for interstate gas pipelines, compressor stations, gas storage facilities and liquefied natural gas export terminals. All this infrastructure facilitates the huge increase in fracked gas production, which creates serious health and safety issues for the families and communities that are in its path. 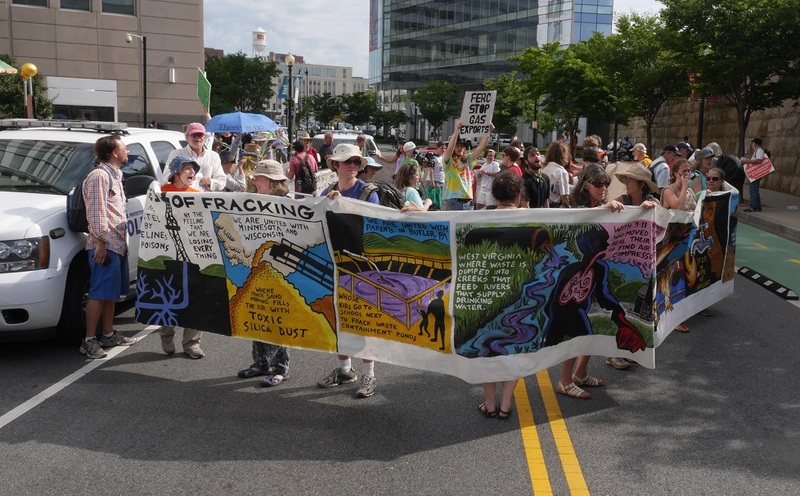 Residents of communities affected by FERC approved projects in New York, Pennsylvania, Maryland, Rhode Island, Virginia, West Virginia, North Carolina, Massachusetts, Connecticut, the District of Columbia, and as far away as Iowa, Nebraska, California, Vermont, New Hampshire, and Maine have joined the protests. Mark Laity-Snyder of Franklin County, Virginia is a part of a group called Preserve Franklin, which is resisting the Mountain Valley Pipeline awaiting a decision from FERC. Laity-Snyder said he is concerned about the fact that commissioners and employees at FERC have connections to the gas industry. Vicki Wheaton and Arlene Hueholt of Nelson County, Virginia are working with their community to resist Dominion’s Atlantic Coast Pipeline. Wheaton said she is concerned that gas infrastructure build-out in her county and elsewhere will increase risk to American lives by offering more terrorism targets. 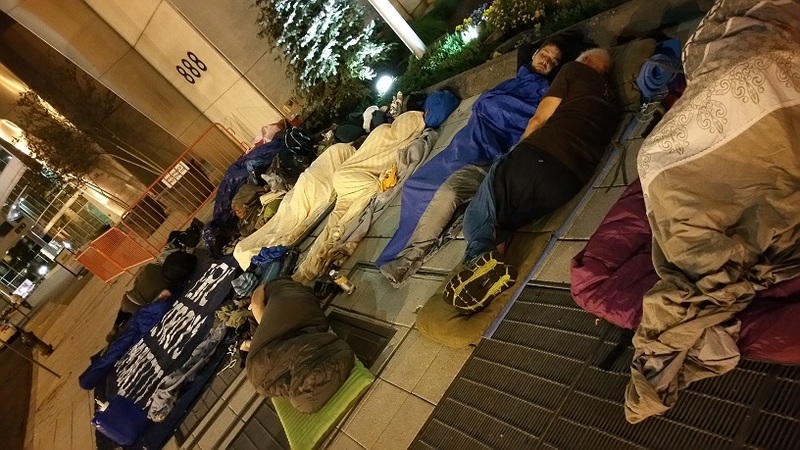 Last night about 15 members of BXE continued a constant occupation on the sidewalk outside of FERC, called the #FERCcupy, for a second night. Those who have come to protest this week are taking turns with the occupation to maintain a constant presence and visibility. The purpose of the #FERCcupy is to show resolve and determination in exposing and changing the approval process within FERC that damages so many communities. The occupation is also meant represent those who are being displaced because of the damage these projects have had on their homes – a symbolic “refugee camp.” One such example is Maggie Henry of Pennsylvania. Recently, Henry was forced to abandon the organic farm that her family has owned for over 100 years due to the negative impact that FERC-approved hydraulic fracturing has had on the surrounding area. In addition, Thursday’s protests were conducted in solidarity with the divestment movement, which calls on institutions to remove their investments from the fossil fuel industry. After the days protests finished, participants convened at Union Station to help Divest D.C. pass out information to the public. Protests will continue tomorrow, and the #FERCcupy is expected to continue tonight and through tomorrow.